« See The Famous Kensington Re-Design! 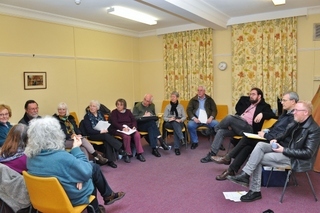 Welcome to the website of Acocks Green Focus Group. We are an active local campaign group in Acocks Green. We campaign for the fixed physical environment of Acocks Green: both to conserve what is good, and to improve what is not so good. Our concerns are buildings, trees, street layout and street furniture and green open spaces. Our site is regularly updated, below, with new posts of ongoing news and campaigns. 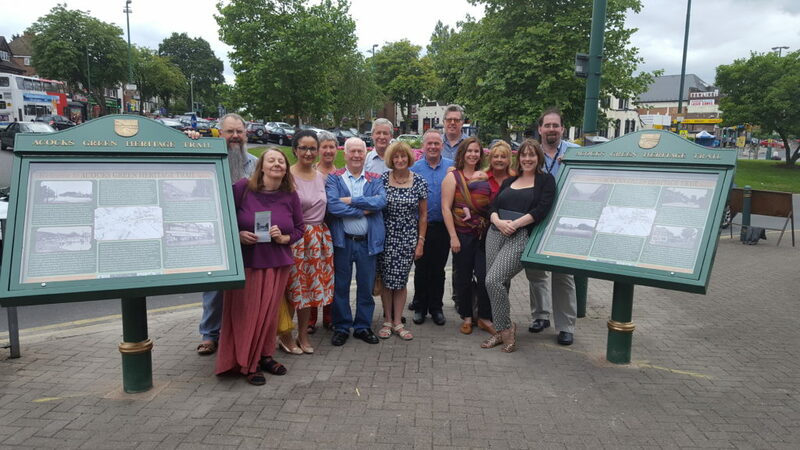 Along the right hand side you will also find some permanent pages about issues of local interest and a set of links to other local websites and to national websites of relevance to our work. It may be that a particular search term brought you here and you started with the posting with that term in it. 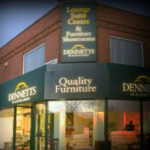 If you live in Acocks Green you will probably find other items to interest you here as well. Have particular things you are interested in, and no time to look through everything? Try our search box, top right. Our latest header pic is all about current main campaign. We need a Conservation Area. Hand-in-hand with the Birmingham City Council Conservation section and a local Conservation architect we have been working on this. Scroll down for more details. 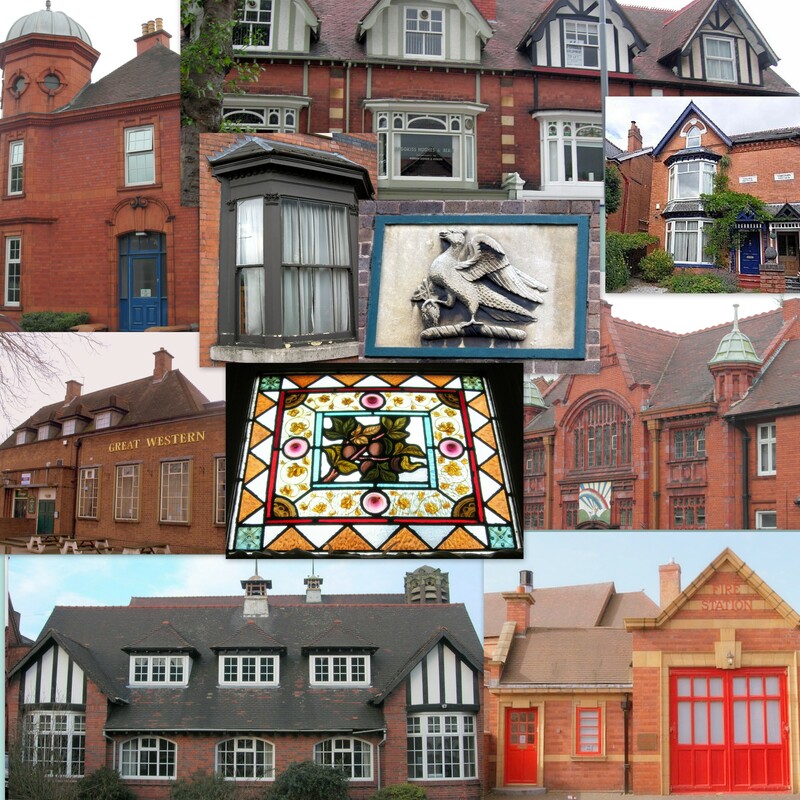 This way we really can kick the developers out, and keep our special local buildings, like the ones in our collage above, safe. 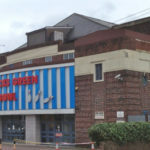 Stop Press: To see more pictures, share your memories of the Police Station and talk about the work to save it more, see us at the Acocks Green Focus Group Stall at the Acocks Green Carnival, on the Acocks Green Recreation Ground on Saturday 7th July. What is the Station Used for? This was interesting, we discovered the following about the uses of the Station. 97 police officers currently use the Station, although not all at the same time. And we saw that each officer has an individual locker. The community service officers for Acocks Green and South Yardley are based here, and we saw six at work on the internet. Locate’ is a key activity at this Station – this is to do with finding missing persons. 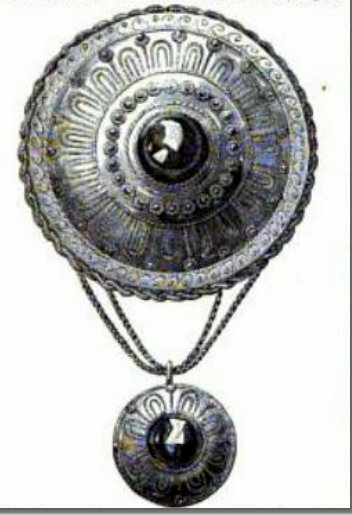 There are three ‘locate’ teams identified with particular areas and a further ‘unsolved locate’ team. They are dealing with missing persons of any age – they have teenagers who ring in saying they are just fed up with their folks, but they may still be at risk of course. They have elderly people with dementia, but also young children. Missing persons are a serious issue. This is a pilot approach which has been very successful and is about to be rolled out across the whole force. It is a system which seems to be quite space and labour intensive. There is a bicycle storage shed with about a dozen bicycles in regular use for quick response, by local police officers. 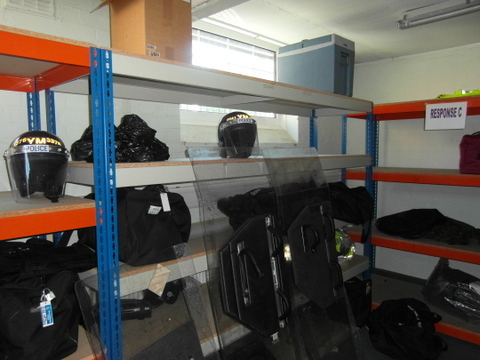 There is a storage room for equipment for all sorts of emergency situations, including riot gear. 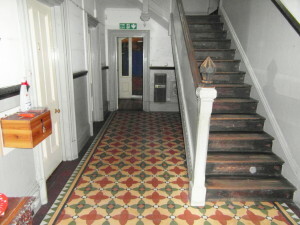 A number of rooms are being used for a Princes Trust project, which ends soon. 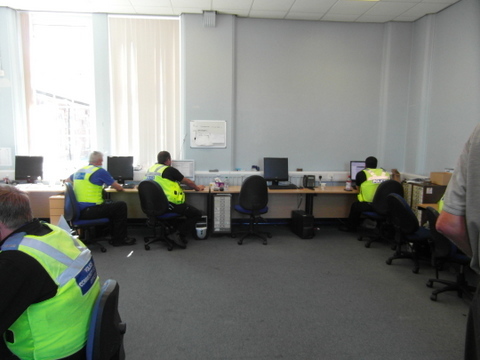 What other facilities are available for officers at Acocks Green Police Station? There is a rest room for off-duty officers. One was sitting on a sofa, with his feet-up watching the football as we went past. There is a ‘drying room’. This is a special area to hang up wet clothing, obviously good for soaked officers coming in from duties on foot, on bike etc. 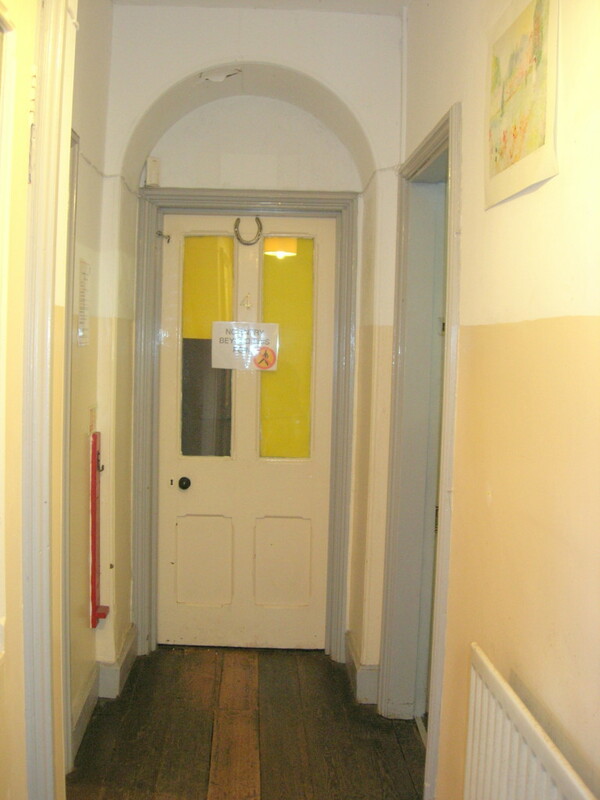 A lot of people know that the Police Station originally had some live-in accommodation for officers. What is less well-known is that The Police Station was also originally designed with no fewer than three houses built into the Station. These were for the Sergeant, The Inspector and the Superintendent. The Inspector’s and Sergeant’s house at Acocks Green Police Station houses, viewed from the back. 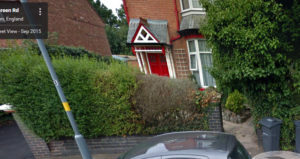 And this bit, which if you live in Acocks Green you already know very well … was the very posh Superintendent’s House, complete with turret. Also interestingly, what is now a car-park area at the Alexander Road side of the Police Station was originally one or more gardens for these houses. There were some small rooms not in use, but other rooms full of police officers working away. 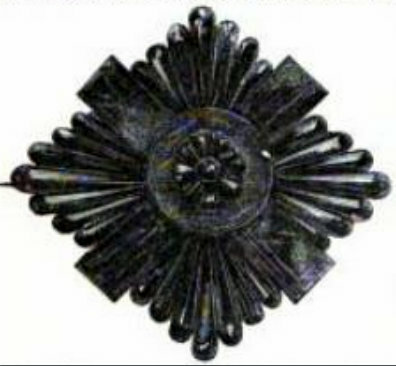 It is obvious that at some point in the past some rooms, including the Magistrate’s Court, and rooms from the houses were roughly divided into partitions with stud walls. This has left some rather awkward corridors, and helped to create a rabbit-warren effect, which we think could be attended to with a radical re-think of the arrangements, and some re-use of the houses for living-accommodation, but we will come back to this under ‘Financial Issues’ below. There is a yearly running cost figure of £64,000. of which £24,000 is rates. No major repairs issues were identified. 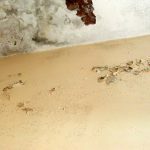 (We photographed a minor issue of damp, probably from a flat roof, in the Magistrate’s Court entrance lobby.) We were shown no other outstanding repairs issues and could identify no other repairs issues for ourselves. We were told that a cost of £300,000 had been identified as necessary to bring the Police Station up to standard. When we asked for a breakdown of these costs we were told that the involved the roof, the heating system and ‘electrical improvements’, but no exact figures were available. We have been promised these, and are still awaiting them. Meantime, however, discussion among the group later turned up the fact that there was apparently quite extensive roofing work done to the Station in about 2005. Several people recall the scaffolding on the building then. What further repairs now need doing, or what estimates have been obtained for these is not clear. We have been assured that efforts will be made to obtain more detailed figures, and this is a matter we will continue to pursue. An issue with lack of air-conditioning was also mentioned. However, we believe that it should be possible to supply stand-alone units in rooms which need them, at a cost of around £300.00 per unit. We were also told the 90% of the costs in running the building are essentially staffing-costs, and these are currently difficult to meet. No clear plans for other Police accommodation in the locality seemed to be available when we visited. We were told that a retail facility (like a high street shop) had already been ruled out, and indeed we think it would need to be a very large shop to accommodate the present facilities.. The only other suggestion made was libraries: Acocks Green Library is full. It is already used for a wide-range of activities and there is no more space. South Yardley Library? This would cut down drastically on the available amount of community space for meetings etc. (And some community meetings still take place at the Police Station.) It would seem unlikely that in these straightened times Birmingham City Council, which is currently facing its own funding crisis, is likely to allow Police use of South Yardley Library at a peppercorn rent! More than this though, facilities at South Yardley Library are unlikely to be the desirable state-of-the-art ones mentioned in the desired £300,000 refurbishment, and more seriously there is no available parking there. The community representatives on the visit felt that this Police Station still has a lot to offer. Useful work is being carried out here. In addition to form a base for community-policing the Locate work for a wide area is being undertaken in the building. 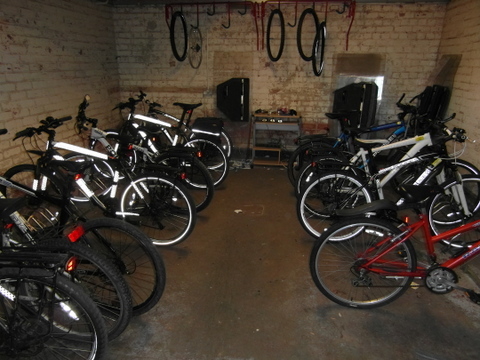 Equipment for crisis situations is stored here, also as a number of rapid response bicycles. 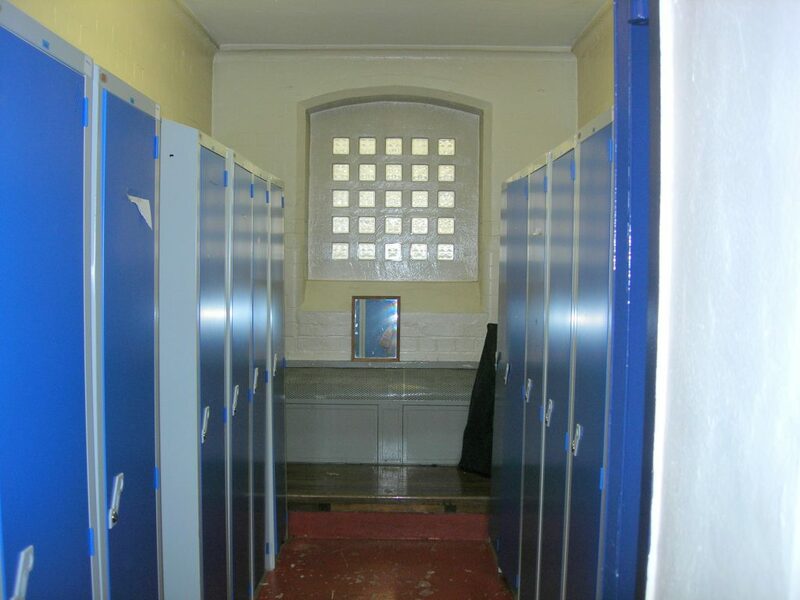 Meantime, overall, the range of facilities on offer for police officers deployed from the building suggested to us, that although there is always room for improvement there are overall good staff facilities on offer, many of which would be hard to replicate elsewhere. The building is very clearly NOT in a poor state of repair. There are potential up-dating costs (Not all-of which need happen at once) but the overall costs of £300,000 for these is fairly modest and could represent a good investment in a still useful building. 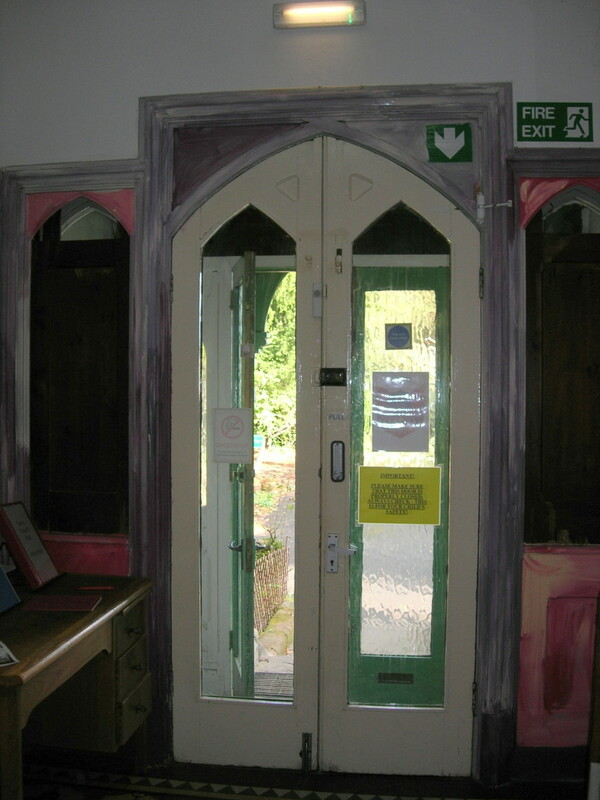 The community became very interested in the three houses on the premises, all of which have their own front doors. Could these be either (1) Rented out or (2) sold? 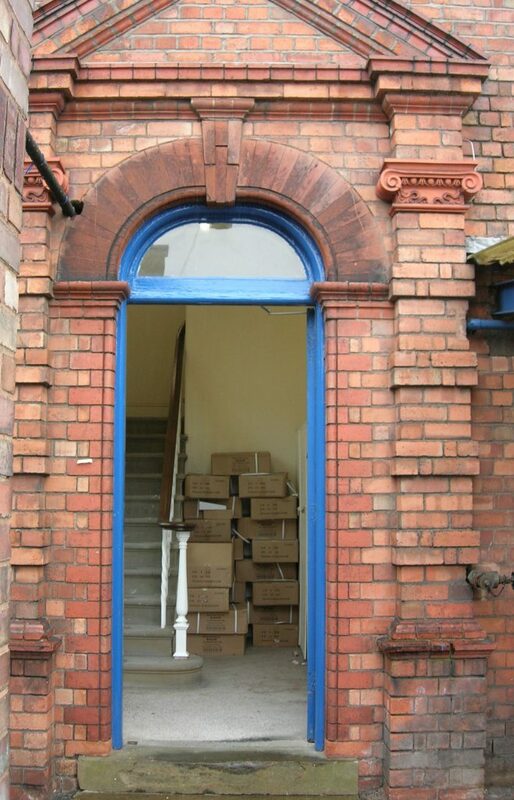 We were told that the Police are ‘not a profit-making organisation.’ However, the The Police in Prestatyn are doing just this, and surely it would be better to engage letting agent to manage the properties and use the revenues to maintain the Station than sell it off in immortal preservation of this principle? Otherwise (2) The three houses could in fact be sold bringing some much-needed immediate capital receipts to ensure the overall survival of the building? Either way, we would also propose that the courtyard on the houses side becomes again a green area with lawn, bushes, plants, pathways, etc. This would instantly make the accommodation area more attractive, as it must have been in the past. We have heard some people suggest that it does not matter if the police station is closed because (since 2015) the front desk is closed. It is however very important to understand that this facility, whilst we are sad about its loss, was only a very minor part of what is still provided in this building. Below we set out firstly why we still need to keep the building functioning in the Acocks Green community as a police station, and the vital role it still plays which would be diminished if these facilities were to be transferred elsewhere. Secondly, we explain the historic and architectural significance of this building, which could be demolished if sold, or otherwise remaining key features inside could be destroyed, and when these are gone, they are gone. Please watch out for a public consultation coming soon. There is likely to be a meeting, letters will be invited and you will have a chance to comment. Austerity won’t last forever and crime and demand on police is increasing. (Police have always been seen as a 24 hour social service and with cuts to other services such as mental health, NHS etc that demand has increased) So at some stage in the future the force will be recruiting again – so where will they put these extra people? Selling off owned buildings for such a poor gain seems very shortsighted. The paragraphs referred to below are from the West Midlands Police and Crime Commissioner Report which you will find by clicking the link. 2) Para 19 says “In the current solution those NPTs (Neighbourhood Policing Teams) are (in the main) the sole occupiers in large mainly unutilised, poor condition WMP buildings with no other corporate functions.” This is not the case at AGPS, which we have been told is fully utilised and is the home for two NPTs (Acocks Green and South Yardley). 3) The nearest retained police station in the policy would be Stechford. Even if there is space at Stechford for both NPTs based at AGPS, their daily travel of a significant distance on busy roads to their beats would involve significant extra cost and loss of time. The Gospel Estate, which has high demand on Police time, is the furthest from Stechford. The Gospel Oak is 4.5 miles from Stechford and 20 minutes by car in reasonable traffic. 4) Alternative bases in Acocks Green and South Yardley are very thin on the ground and would involve significant cost. 5) The important architectural features of AGPS (See below for more information) mean any new owner would face costs to retain – or massive local opposition to their destruction. This will have an impact on the sale value of the site. The cumulative impact of these points is, that however it is delivered, the net cost saving of closing AGPS are minimal, while the disruption to the NPTs and loss to the community is significant. We do not therefore believe it delivers value for money. Moreover, what kind of message does closing police stations send out? The police are no longer visible in our community. They are not looking after us, but giving up? Crime is not being fought – great if you are thinking of breaking the law … and finally on this subject? Liked the front desk at the Acocks Green Cop Shop? If the building is closed and sold off it can NEVER be reopened. Otherwise, that is something that maybe one day we could have back? 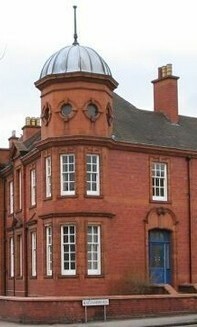 This locally listed, unique red terracotta brick building, with its unusual octagonal turret, was built in 1909 for Yardley Rural District Council and incorporated a courthouse which is still intact inside the building today. The original police cells are still in the basement of the building as well. The building was designed by A. 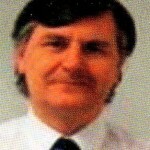 B. Rowe, Worcestershire County Surveyor and Architect. 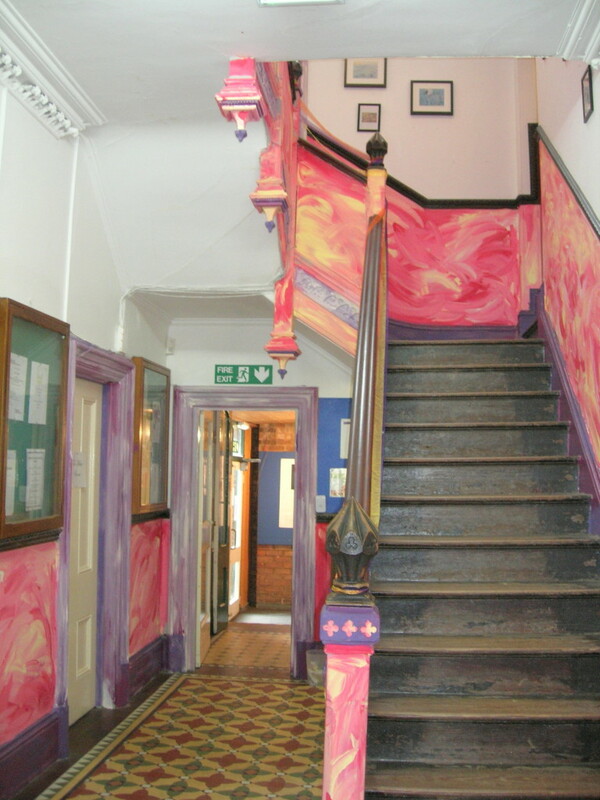 He also designed Acocks Green Junior School. 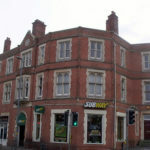 Together these two buildings now form a key part of Acocks Green history. 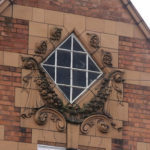 The sumptuous nature of the external features of the building is thought to reflect the fact that Worcestershire County council was then trying to woe Acocks Green to remain a part of Worcestershire: hence the Worcester three pears emblem over the front entrance of the building. Sadly, but perhaps inevitably, Acocks Green chose to be become part of the City of Birmingham two years later, in 1911. They would appear in the main Courtroom through a very grand entrance, pictured below and still fully intact. 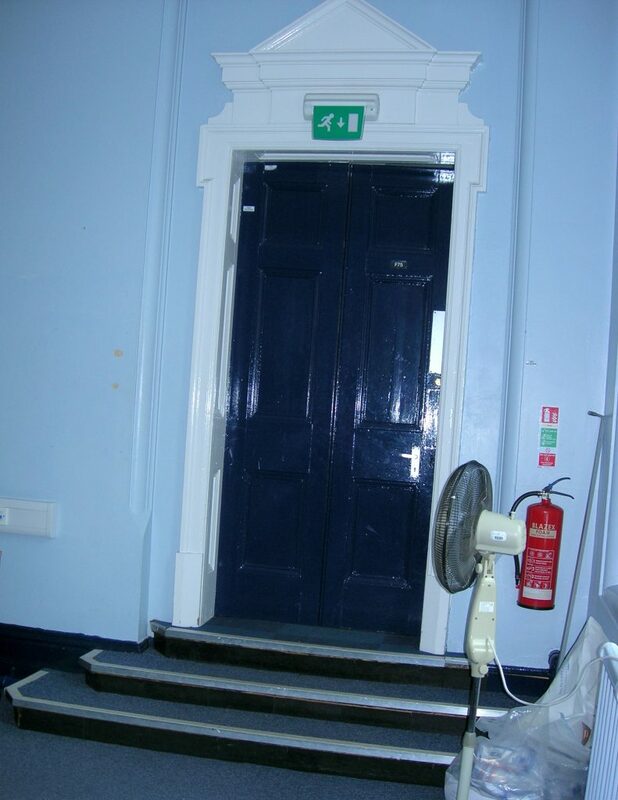 Door through which the magistrates would appear in the court room. If people waiting to see them were in custody they would be brought up from the cells in the basement, which are still there. Note the stark contrast between the doors of these, and the magistrate’s grand door. The effect would have been intended to be humbling. 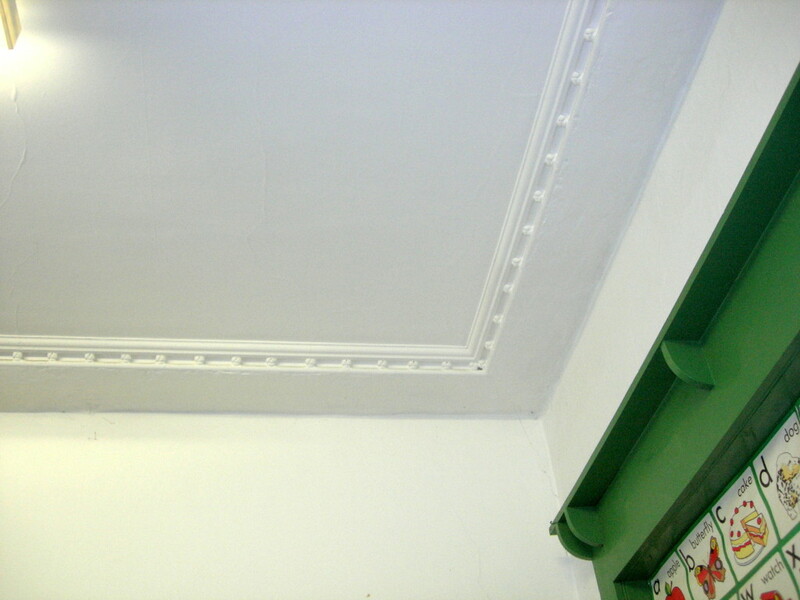 You will find more pictures of Acocks Green Police Station here This includes some tantalizing glimpses of what still exists behind modern false ceilings. The proposed Boundary Changes for Yardley Constituency – to come into effect in 2022. You have until the 11th December 2017 to comment. Just want to get on and comment now? You can make your comments to the Boundary Commission here Otherwise read on for more information. This link will also be repeated at the end of this blog post. 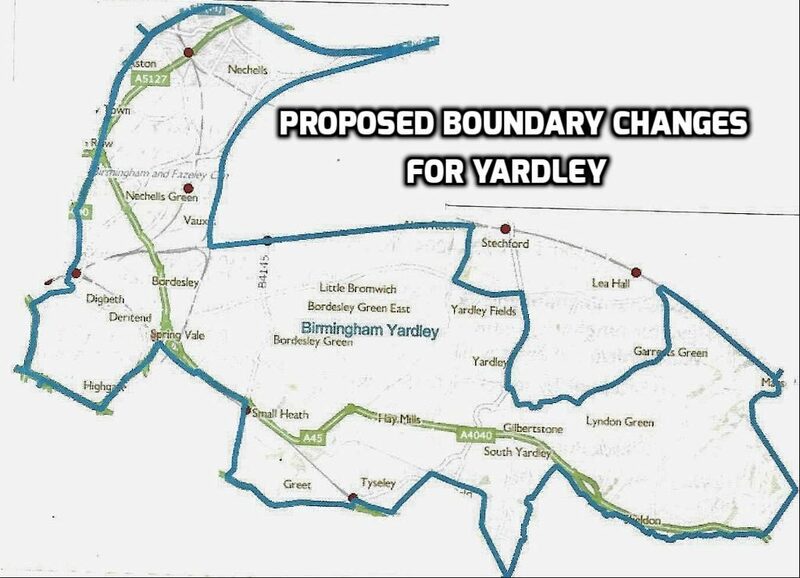 Have you seen the proposals to change the boundaries of Yardley Constituency yet? If these the new proposals go through these changes will take place in 2022. Historic old Yardley would not be in Yardley anymore – not more old Yardley. 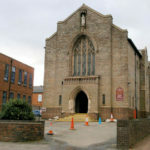 No more St Edburgha’s: that would be in Hodge Hill. Meanwhile Yardley would be an area which would stretch all the way from Selfridges in the centre of Birmingham to Birmingham Airport out in Solihull? 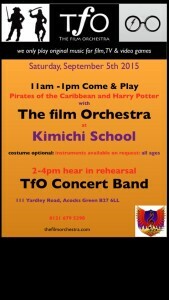 Live in Nechells? Live in Lyndon Green? It would all be in the new Yardley. What would not be in Yardley anymore is Acocks Green. That would be in Hall Green. Confused? How easy would it be to travel to see your MP? For a lot of people that would be quite difficult, involving more than one bus. What other differences would that make to you? Where do you go if you have a problem? We had a meeting for community activists and all three main political parties. People came and shared their concerns, talking frankly and openly regardless of which party they were in, or if they were in no party. 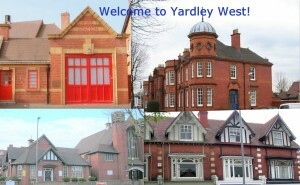 This is a common project to help keep Yardley safe! We made a list of all the things which are bothering us. You might want to see your MP. You might talk to a councillor. 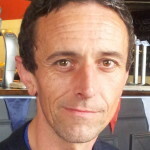 You might even talk to someone who is not an MP or a councillor, but who is campaigning to be one and wants to build a reputation in the area by helping people out. Think about it: Labour is the party in Yardley with the MP at the moment, BUT Yardley has councillors from the Labour and Lib-Dem Parties and in the past twenty-five years all three political parties have held this famous switch constituencies. All three parties knock on doors, make phone calls to see people are OK and do ‘case work’. It is often the local politicians who know whose disabled access is being blocked; where a children’s swing needs mending; where illegal fly-tipping is going on. If a whole area is shifted out of kilter like this then a lot of this case work is going to get lost and confused. And Acocks Green tends to be the area in Yardley where most party members (all parties) are the most busy helping, organising and supporting. It is the area in fact where the current MPs office is based. More than this some organisations, like The Police, are structured to operate across the existing constituency. Some grants are given out on a constituency basis. Different parts of the area do not have very good travel routes between them, and part of the proposed constituency is even divided by a river with only a few bridges! Perhaps most worryingly of all: the new reorgnisation would bring a very high level of social need into the area, with fewer councillors under the 2018 re-organisation to help, fewer local activists and an MP’s office having to look after more people travelling further distances to see her (or him). What Can I Do Though? The 16 Flint Green – Decision Doc 22 December 2016 makes clear that the Management Plan must this time be ready in a month. We will be watching closely that the other conditions here are observed. Where do we go from here? We accept that some accepts of planning law are currently weak. However, we feel that the final decision was too swiftly rushed through in this meeting, and that officers seemed too closely engaged in the process of getting that decision. This year we hope to finally achieve a A Conservation Area for Acocks Green This would introduce clear rules which should help prevent planning like this one being passed. has now been a number of years in the making. The work from our side has long been done. The problem has been funding from the Council in this age of austerity and Council cuts. There is a possibility of some funding this year, We do not know yet, and cannot make any promises, but watch this space. All three local councillors (Roger Harmer, Lib-Dem), Stewart Stacey (Labour) and John O’Shea (Labour) have joined with local residents to protest against a threat to the proposed Conservation Area in Acocks Green. At the moment it seems that the Planning Committee agrees with them, but we anxiously await a final decision on Thursday 22 December. The developers, New Leaf Recovery, gained planning permission last July to convert the property in question into a care home. 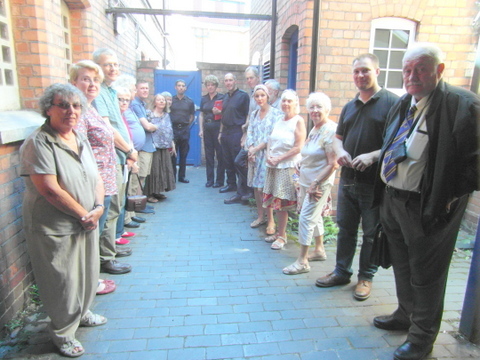 So controversial was the plan for this key road in the proposed Conservation Area that the entire Planning Committee clambered onto a bus to come down to Acocks Green to have a look – with council budget cuts this kind of ‘site visit’ is now a rare event. 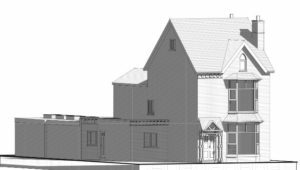 At this time councillors were assured that there would be no changes to the exterior of the property and believing that all was therefore well, despite the fears of local residents, they voted to allow the conversion to a care home. However, anger broke out at the Planning Committee on December 8th after a new plan was put forward which involved changes to the exterior including a new side extension, considered by many to be both unattractive and unnecessary. […] to get the necessary 3 spaces, the original front wall, is removed and an arrangement of parallel parking is proposed which is clearly utterly impractical. The two cars at the front would make a safe exit from the front of the building impossible, should a fire break out at the rear of the building, which is where the kitchen is. And of course actually getting in and out of the cars themselves would be very difficult. It’s clear to me that there never would be three cars parked there and that this diagram is just to get the application through planning. Here is that diagram. Look for the three tiny oblongs in front of the red area: tight, isn’t it? This view on the left reflects many other vistas in the road: see a selection below. Remove these and one key part of the character in the proposed Conservation Area is gone for ever. More than this though, it is unclear exactly what the developers would gain. They say that the plan is to retain the current nine residents. However, before this the residents were to be in seven bedrooms, with two bedrooms shared in a scheme described as a ‘buddy-up’ scheme to support vulnerable residents. We don’t object at all to the residents being there. We know they are here to stay and thought the buddy-up scheme, using two large bedrooms, sounded like a great idea. Why then are three extra bedrooms now being added, in a clunky and expensive scheme on the side of the property, when councillors were promised this would not happen. This would now keep the nine residents in separate rooms without the support which was said to be so vital to some before? Experience? Hardly: New Leaf Recovery have now been running a property in this road for nearly two years, with shared rooms, and should therefore know all about how good (or bad) the ‘buddy-up’ scheme is already. To see how baffled and frustrated the BCC Planning Committee councillors felt watch this video of the meeting – choose clip 8 (16 Flint Green Road) There was no disagreement across political parties here. 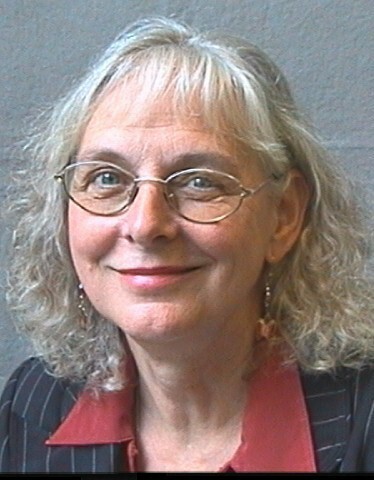 Carol Jones (Lib-Dem) said she was ‘[…] very disappointed in New Leaf. Bob Beauchamp (Conservative) called it the ‘[…] industrialisation of a charming house in a charming row of houses’. Gareth Moore (Conservative) complained ‘We were assured that there would be no change.’ Keith Linncor (Labour) said ‘I feel let down after being reassured at the site meeting […] the changes are not to my mind essential’ Fiona Williams (Labour) found that ‘[…] the reasons for the extension seem to be very weak’. The Committee appeared to feel that it has been taken for a ride in more ways than one! So why are New Leaf really wanting to do this? We are not speculating … and at the Committee councillors were asked not to. However, does not knowing why a developer wants to do something provide a good and rational reason for voting in favour of knocking down an original Edwardian wall and adding an ugly side extension … in order to provide accommodation for no more residents than before. (We are told.) The sceptical councillors, who had been recommended by the Planning Department to approve this plan, unusually voted to ‘defer minded to refuse’ – 10 in favour, 2 against, 1 abstention. They take their final decision … to refuse we hope, on Thursday 22 December. This proposal would alter the character of a property that serves as one of the gateways to the Acocks Green conservation area – we should be protecting it from this overdevelopment. 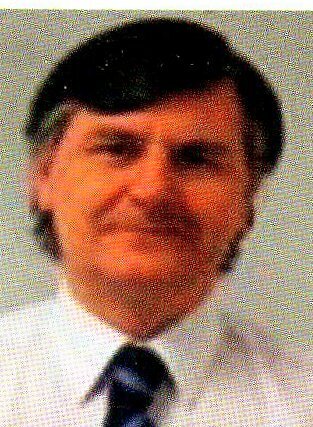 Councillor Stewart Stacey is also recorded in the latest planning report as supporting Acocks Green Focus Group in their objections and expressing concerns about the ‘creeping development’ of the site. One final piece of food for thought: New Leaf were also told in July 2016 that they must provide a management plan showing a way to liaise with local road residents before moving from Number 24 Flint Green Road to Number 16 Flint Green Road. These were their instructions. Which was why Flint Green Road residents, who have to this day not been consulted about how they are to be liaised with, were rather surprised a few weeks back to find this interesting notice on the door of number 24: It reads: ‘New Leaf has moved 3 doors to the left to 16 Flint Green Road. Thank you.’ Oops. No thanks to or from the Flint Green Road residents who were not consulted first about liaison arrangements, as per Condition 1 of the July Approval notice. The necessary new brief report since the shock ‘minded to refuse’ decision by the Planning Committee tells us that the management plan to include a liaison scheme with Flint Green Road residents (which beforehand was apparently absent-mindedly overlooked) has now been approved … but without consultation with the concerned residents of Flint Green Road, who remain mystified. 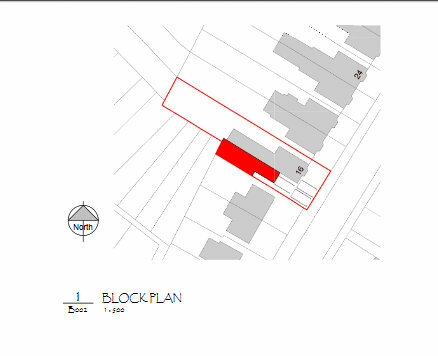 The 16 Flint Green Road Management Plan has now been share with us by Planning. This remarkable document informs us that there is to be parking space for five cars. Allowing for tightness of space this is optimistic even in the present situation, before any additional building on the side. We are also told that the maximum number of residents is to be seven, which conflicts with the earlier planning permission which is for nine residents. Residents report that they were invited by letter to visit the property many months ago, and before the earlier Planning Approval to Convert to a C2 (Care Home) was given. There has been no attempt to liaise with them since, or to discover their liaison preferences, and it is very unclear to whom the very vague invitation to make ‘comments, complaints and compliments’ is addressed to. The residents confirm that they have neither been sent this, nor given any contact details or other advice about how to go about making these ‘comments, complaints or suggestions’. It seems reasonable to ask why this shoddy plan was ever approved in the first instance, but it does not speak to a positive or caring attitude towards the road or its residents. 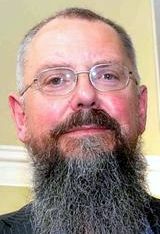 We congratulate Cllr O’Shea for his election victory last night, and his retention (now since 2012, and until 2018) of his council seat for Acocks Green, one of the four wards of Birmingham, Yardley. 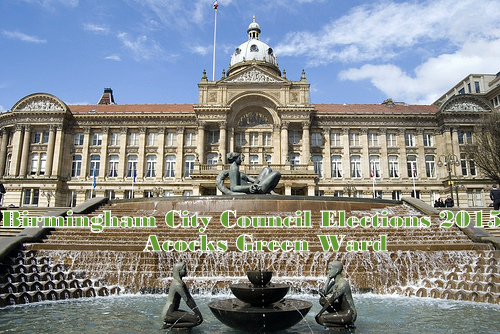 Thanks again to all of the five candidates who took part, and seriously applied themselves, to this on-line hustings, without their efforts this blog post would have been impossible, and thanks to als to them we have succeeded in continuing a serious pre-election debate about Acocks Green issues, before these become crowded out by wider political concerns in Birmingham and nationally. Some of these debate, e.g. 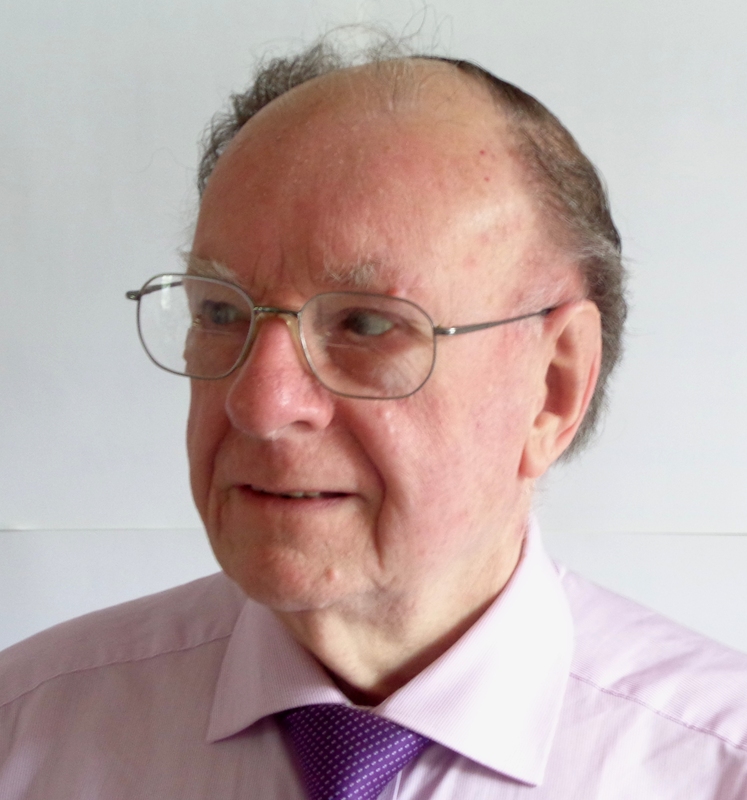 about the possibility of a parish council: something all candidates indicated they were willing to support, now looks set to continue more quietly behind the scenes. It was also heartening to see all five candidates pledging support for Acocks Green’s proposed conservation area. This is a scheme which will hopefully come to fruition these year and continued cross-party support will be helpful. In this connection it is also heartening to see support from all on the question of the uses to which larger properties in Acocks Green should be put, and the need to avoid, where possible, clustering of large properties converted to non-family homes. Above are the early results info is borrowed from The Birmingham Mail. So what happened? It was clearly overall Labour’s night in Birmingham, with Labour adding two more seats to its previous 78 on Birmingham City Council and retaining all of its identified marginals including in Acocks Green and in South Yardley. We know there are national factors at work in these results, with Labour being particularly intent upon defending its existing seats in the face of much current national debate about its position. In Yardley constituency, as a whole, there is also an interesting additional local factor which is that for a long time this constituency has been the Lib-Dem stronghold in Birmingham. Council elections battles in Yardley have for many years have centred around one question only: will the winner be Labour or Lib-Dem? There was no shortage of paper arriving through the door from the major contenders, both with TUSC and the Conservatives were also clearly keen to be heard. However, it appears that near the day both of the areas main parties chose to concentrate their campaign resources and personnel around their existing seats in Yardley. 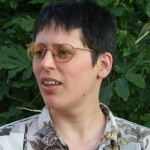 It is noticeable that neither of the key candidates achieved the results as high as those enjoyed by last year’s candidates but last year, in 2015, both candidates were also running on the same bill as the candidate for the parliamentary seat in Yardley, so even more resources and person-power was involved. In Acocks Green John O’Shea (Labour) also enjoyed the advantage over Penny Wagg (Lib-Dem) of being better known as the ‘incumbant’, or seat-holder, and a now a well-known face in Acocks Green, with a strong presence on social media and also an established figure in the Labour MP’s office on the Yardley Road, whilst the Lib-Dems have no MP and therefore no MP’s office at all. In terms of actual policies perhaps what is most noticeable is the difference between Labour and Lib-Dem in Acocks Green on matters to do with waste and speeding. 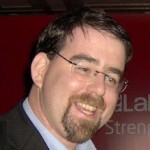 In regard to waste the Lib-Dems proposed back one bulky household waste collection with Labour preferring to concentrate upon taking legal action against fly-tippers. On speeding the Lib-Dems tend to favour physical traffic-calming over Labour’s planned use of signage in the hope of lowering speeds. These are debates which will no doubt continue Turning to the other candidates: there are one or two surprising alliances, and intersting comments, For example Penny Wagg for the Lib-Dems and Eamonn Flynn for TUSC find themseles in some agreement on the issue of BCC expenditure upon waste collection, and Richard Sparks for the Conservatives, also discussed expenditure here, albeit with a different emphasis. 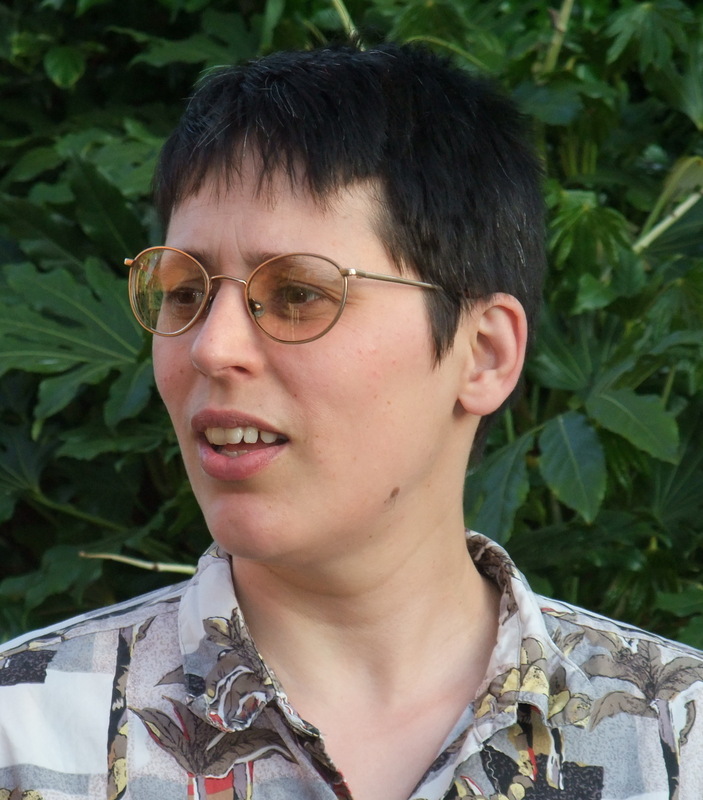 Meantime, Amanda Baker for the Greens proposes some completely different ways of handling waste after the ending of the present contract with Veolia at the Tyesley recycling depot in 2019. All candidates other than Labour appear sceptical about the value of the 20 mph signs for reducing speeds in the ward. 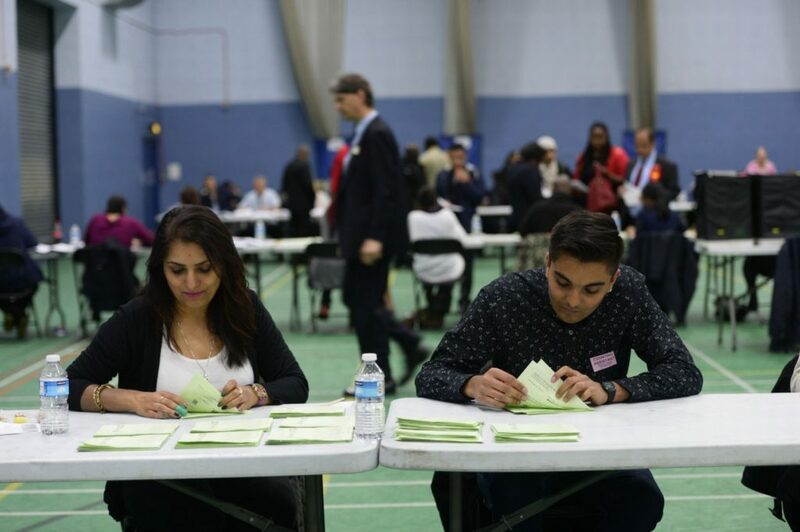 None of the ‘minority’ candidates would have expected to win this ward election, and generally their results reflect less of the turbulence of the local two key players. However, Richard Sparkes’s reduced vote here is (speculatively) the result of national factors. It really wasn’t the Tories’ night in Brum, or in most English councils! 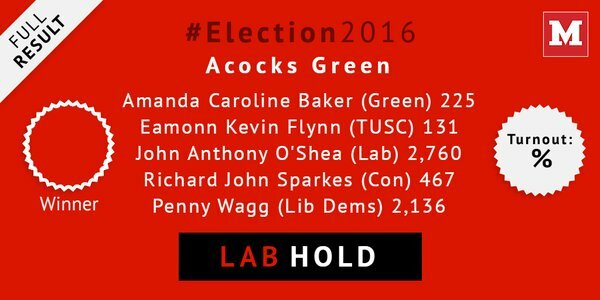 We hope to continue to enjoy the contributions of all candidates to the regular Acocks Green elections debate, and look forward to welcoming some of these candidates, and their colleagues, back in 2018. Meantime, we await final decisions upon ward boundary changes, now delayed for another round of discussions. (Watch this space.) and we will also need to wait to see how the boundary changes will affect election battles in 2018. It’s that time of the year again. Which Birmingham City Council candidate has the best policies in order to care for the fabric and structure of Acocks Green? Who do you want to send in to the Council House to represent Acocks Green Ward? This year we have a line up of five of the six candidates standing. 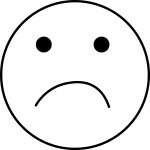 (Unfortunately, despite several approaches we have been unable to get any response from the SDP.) They have all been doing their homework, putting care and time into answering some Acocks Green orientated questions. Now it is up to you to decide. Click on the names underneath the, alphabetically ordered, pictures in order to read each candidate’s answers. We will announce the winner here in due course. 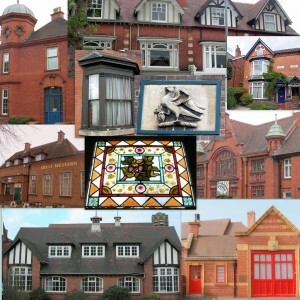 Eastbourne House in Acocks Green is under threat. 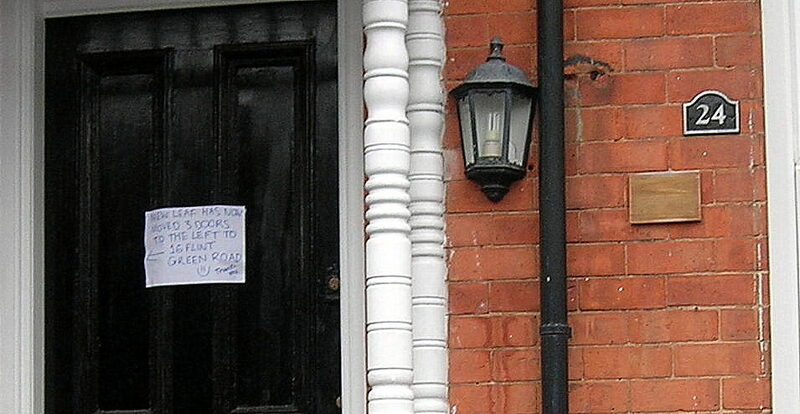 Those who live in Acocks Green will probably know something about Eastbourne House. For those who do not, the building is somewhat tucked away and probably unknown … unless they happened to go to school there. 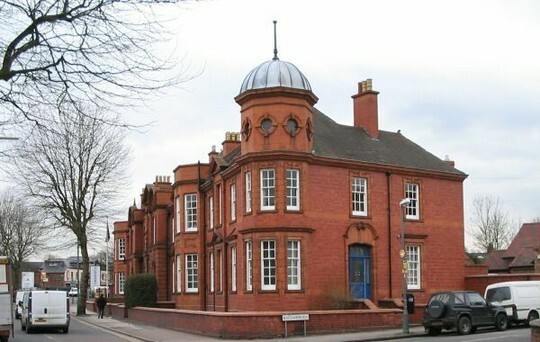 Eastbourne House (111 Yardley Road, Acocks Green, next to Acocks Green Junior School) began life as Fern Bank: one of four very grand Victorian houses built on Yardley Road in the late 1850s. 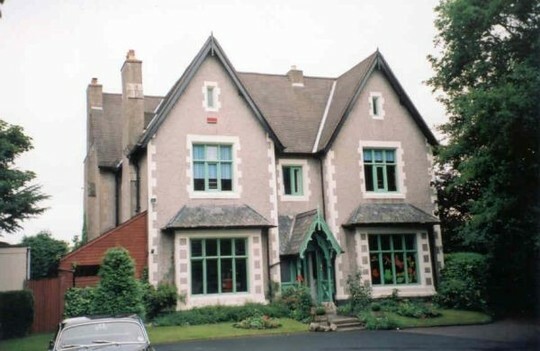 The other three houses were demolished in the 1950s and 1960s and the Junior School, Beeches Avenue and Langley Avenue now stand on the spaces. (One of the other houses was called The Beeches). 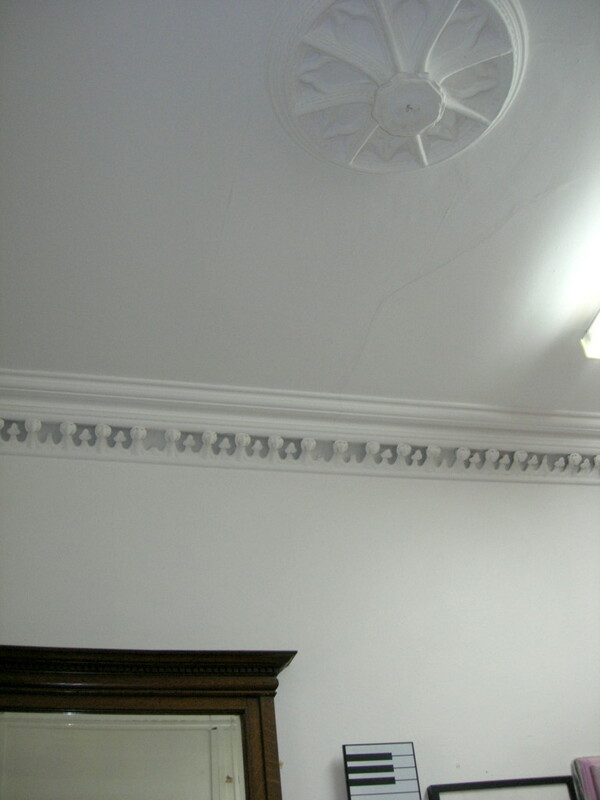 Eastbourne House is locally listed Grade B.
John Barker draper. He lived at Fern Bank, which became Eastbourne House School on Yardley Road after the War, and is still standing. He is described as a Mourning Draper. His business was Bach and Barker. Mourning drapers and undertakers, of 42 New Street. 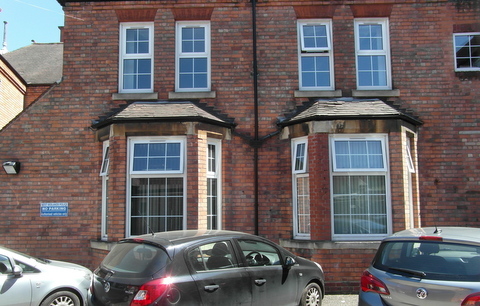 This grand, ten bed-roomed house speaks to the glorious past of Acocks Green when encouraged by the new Great Western Railway line, many prosperous Victorian men moved out here from the busy City centre, and brought their families into what was then a country idyll. Times change. Eastbourne House has been a school since 1948. With a short gap from 2008-2013 it is a school again now. 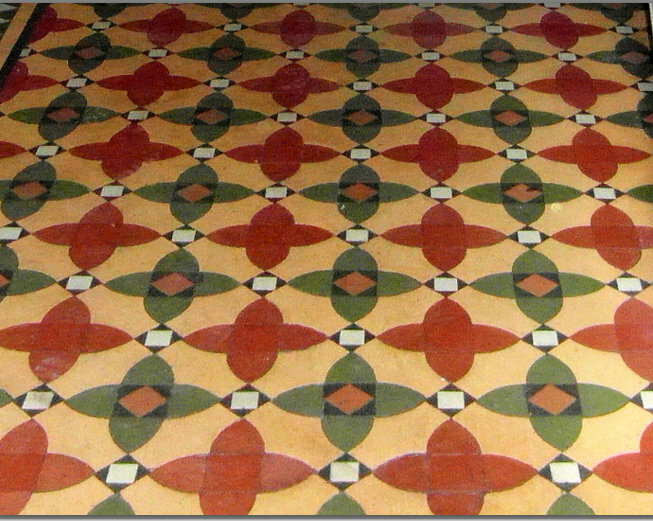 It retains many of its original features, including some of strong character. The layout still gives some idea of how a wealthy and successful Victorian tradesman’s family would have lived, complete with coach house attics and cellar. Yes, this is a fee-paying school but they emphasise that fees are kept as low as possible (This is not a Michael Gove scheme ‘free school’, and no state grants are received.) The main aim has been to teach music, as well as a general syllabus, to as many children, of as many different levels of ability and talent as possible. 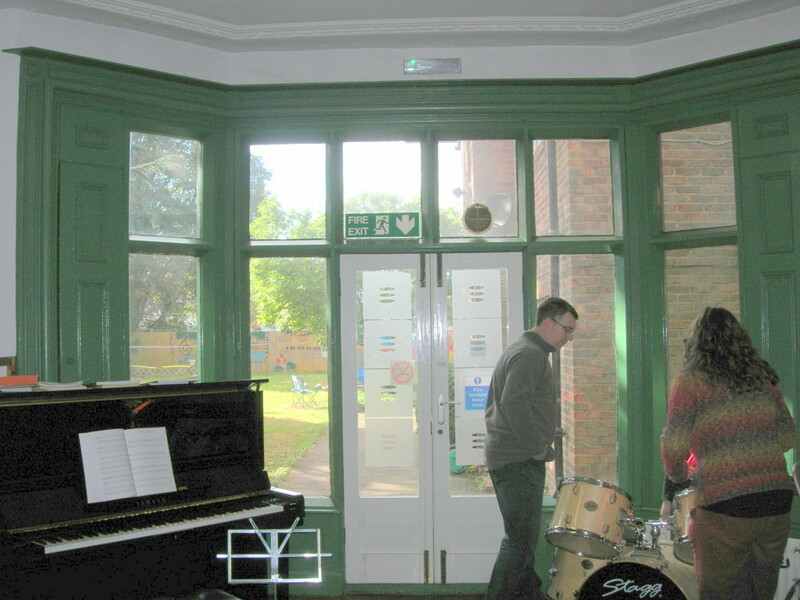 The local community has frequently been invited into the building for free concerts, and to take part in singing and playing. Free entertainment has also been provided at many local venues. 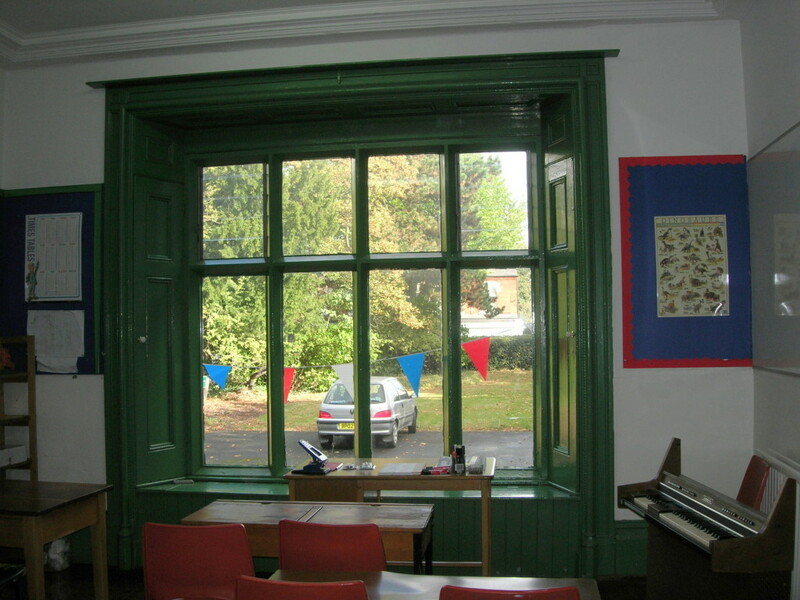 The building seems to continue well, and without too much modification, in its now long-established mode as a small school with plenty of small classrooms, and some twentieth-century adaptations like school cloakrooms and sets of WCs. 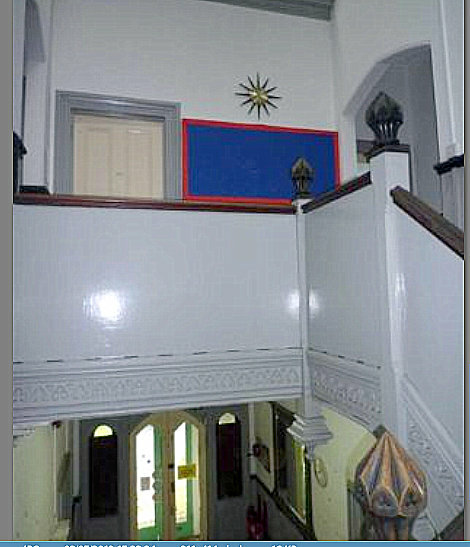 Below are some interior pictures of Eastbourne House: a busy and active school for many decades. It is not smart, perfectly restored or in any way ‘pickled in aspic’, but a working building with a possible healthy working life of many more years to come. If you want to help keep this building standing and alive you might consider helping to crowd-fund its future by donating towards that sum of money. Otherwise, look out for future planning proposals. Be ready to object. Remember, however, that your objections may not be enough. 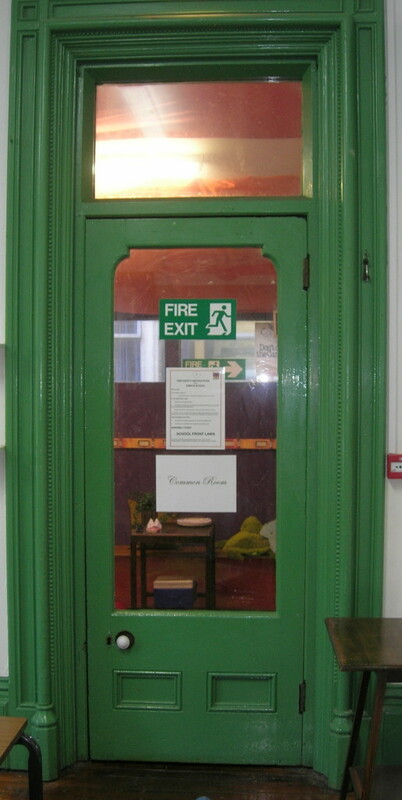 East bourne house – inner vestibule door – clear glass presumably replaces stained glass or wood. Update We lost. We came so close: five councillors voted against the plan and five for, with three abstentions. The Chair went (as he probably had to) with the planning officer’s recommendation to approve. This was not to say that any of the planning committee councillors appeared to like the plan. They talked about it for nearly half-an-hour and it is obvious that they did not. The sticking point appeared to be the lack of clear Council policy documents in a case like this, and fear of the Council being sued. Further comment later. 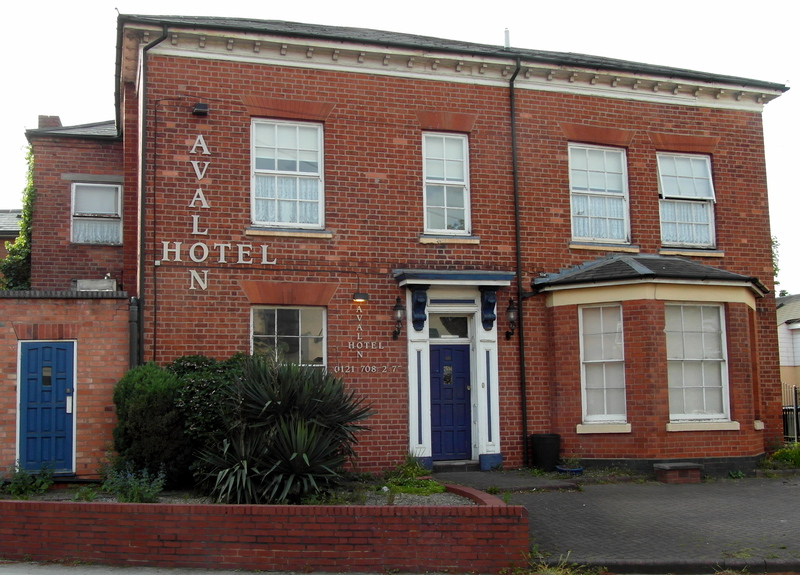 Acocks Green people and conservationists have been stunned to discover that a planning application to convert the well-known Acocks Green building: The Avalon Hotel into a House in Multiple Occupation is recommended for approval by Birmingham City Council Planning Department. We are opposing this application and in doing so have the backing of Acocks Green Neighbourhood Forum, nearby Arden Residents Association and all three local councillors, who are from two different political parties. The plan goes to the Planning Committee (Fifteen councillors) on Thursday 9 July, for a final decision. We will be there delivering a speech explaining why we oppose, and the Committee will then vote. We are now calling on as many people as possible to join us now by writing to oppose this application. This can be done on-line simply and easily by putting your objections on the comments link here to oppose the p.a. for The Avalon Hotel Remember, even a brief comment will be counted. To help you understand why Acocks Green people are so upset about this application, and to help you in formulating your comments, there are some notes below. Why is the Avalon Hotel Important? 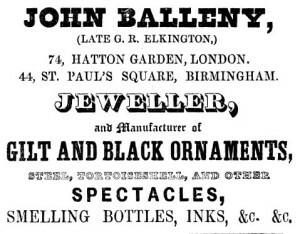 This clearly meant that Mr Balleny was using the Great Western Railway, with its station virtually opposite his house, to get to work. This in itself reflects a key part of Acocks Green history. Thetwo earliest local stations on that line seem to have been Acocks Green (1852) and Hockley (1854). 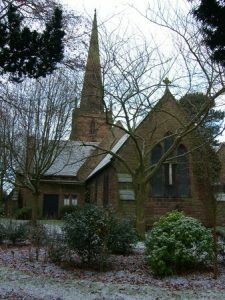 We know, because they are recorded in trade directories and other places, that many, many Hockley industrialist moved out to green and rural Acocks Green, brought their wealth and established their great residences and helped set-up other local facilities like churches and meeting halls. 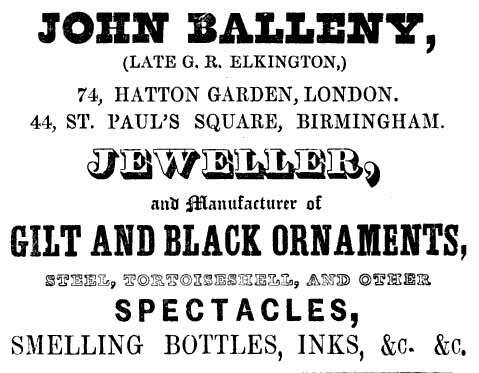 Mr John Balleny of Birmingham exhibited several satisfactory examples of the Art progress of that town. Some are pure gold. Others imitations. 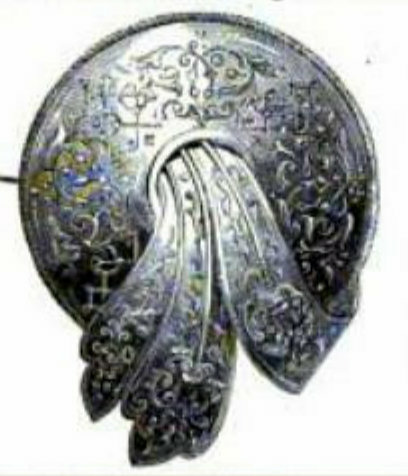 We engrave three brooches, one being a substitute for, and perhaps superior to, jet. Does The Avalon have Surviving Features? 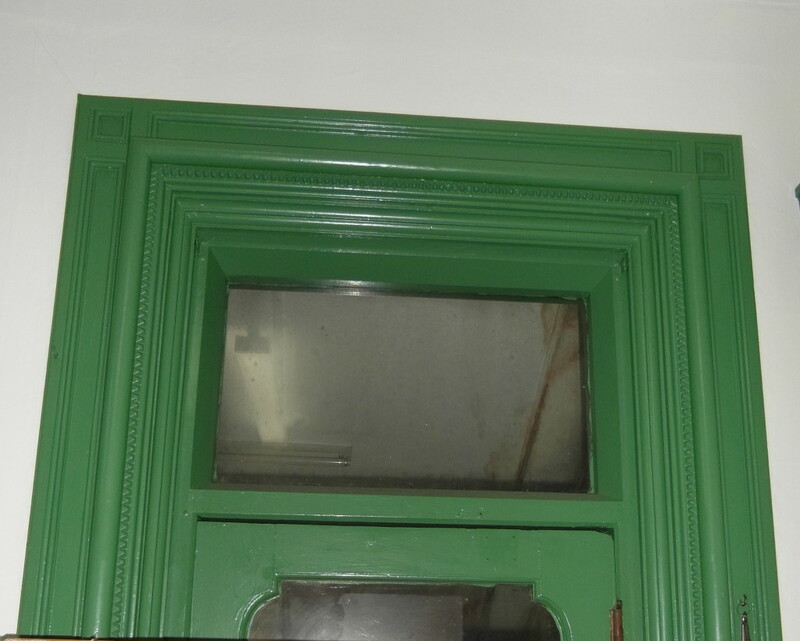 Yes it does have some features, including a good plaster work ceiling and a fireplace and … so we were told at Acocks Green Carnival … a rather lovely Victorian loo! What is the problem with the Application? Some aspects of the property are potentially fragile. Even without this factor though the application is worrying to Acocks Green people because it entails eleven people using the original hotel ensuite facilities to rooms, but sharing one living room and one kitchen. 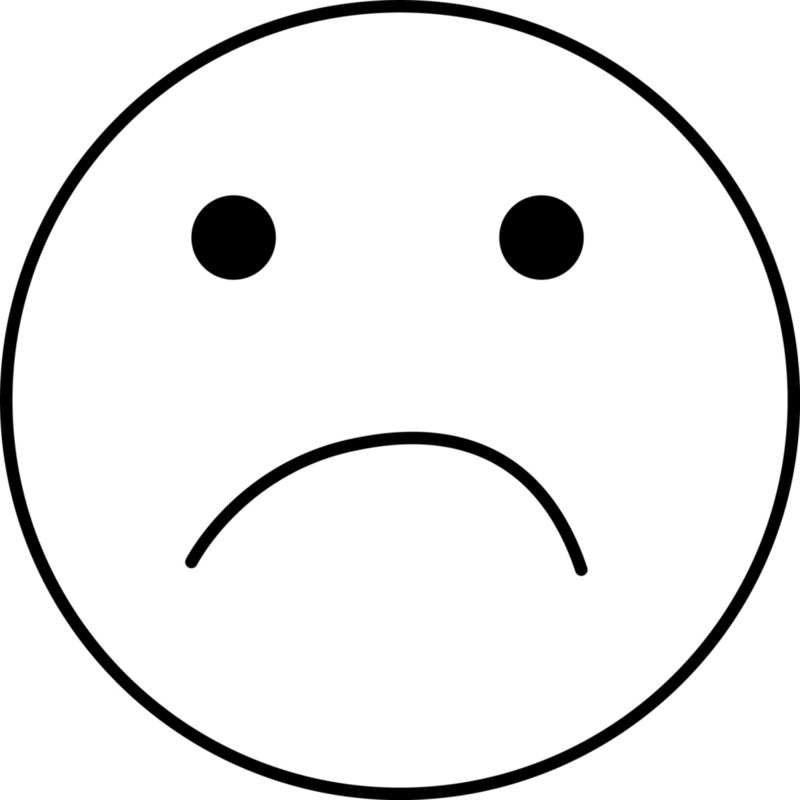 We do not think this constitutes a desirable living arrangement for anyone and after wide local discussion, including with local landlords a former student accommodation officer and HMO tenants, the conclusion is that this property is unlikely to remain a happy one for long. There are likely to be arguments. 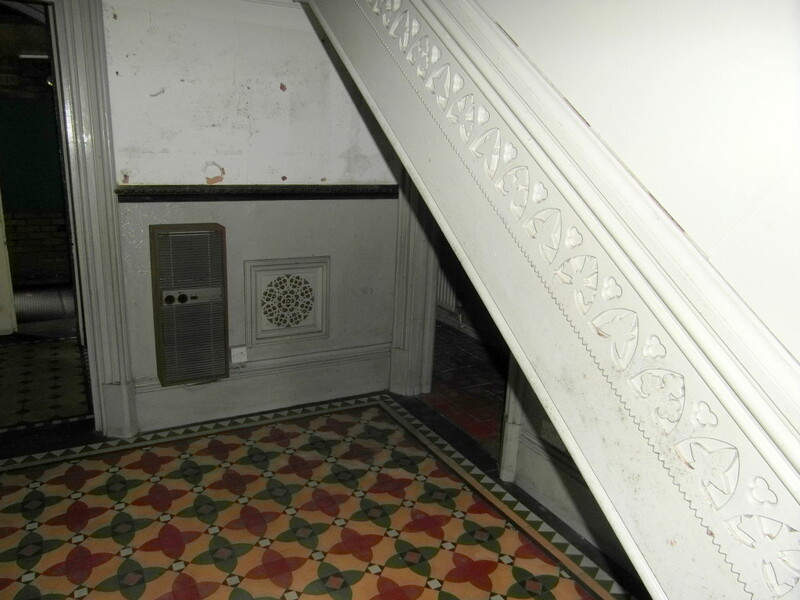 Aspects of this property, which is valuable to Acocks Green history, could become damaged. Bizarrely, the report recommending that the Committee councillors accept this proposal claims that any problems within the accommodation are a ‘management issue’ which can easily be managed between a landlord and tenants. This ignores the point which we have already urged which that there will beno-one on premises to supervise most of the time. This is not normally the case with a hotel, and it is not appropriate to compare the two types of accommodation in this way. 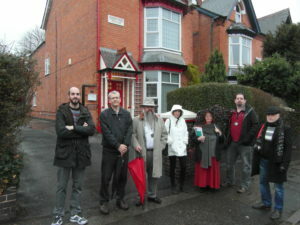 Please support Acocks Green people in objecting to this planning application: see link at the top of this post. Note: this is not an all-out attack on HMO landlords or their tenants. This is a property which is presenting specific and unusual concerns and we do not really believe that many people would be happy living in this property for long, or that any landlord would find it easy to manage. The potential for poor effect upon the immediate neighbourhood does not take much imagination to work out. We accept that other nearby properties are already divided into flats or operate as HMOs. We doubt that any other property around has as many as eleven tenants with such poor provision of facilities. It’s that time of the year again. Don’t forget that there is a local election just around the corner, as well as the hotly debated national one, and happening on the same day with polling in the same places. 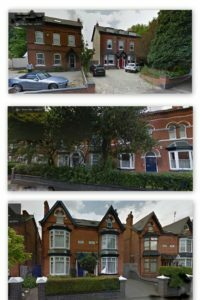 Which Birmingham City Council candidate has the best policies in order to care for the fabric and structure of Acocks Green? Who do you want to send in to the Council House to represent Acocks Green Ward? This year we have a line up of seven candidates. They have all been doing their homework, putting care and time into answering some Acocks Green orientated questions. Now it is up to you to decide. Click on the names underneath the, alphabetically ordered, pictures in order to read each candidates answers. We will announce the winner here in due course. First we would like to thank all seven candidates who took part in our on-line survey. 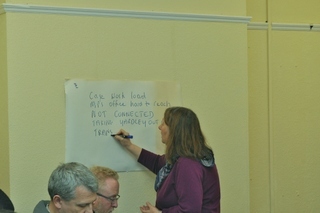 All spent time composing thoughtful answers about Acocks Green issues, and contributing to local debate on these. All these 2015 pages will remain on display (with an explanatory note) until shortly before the next local election. 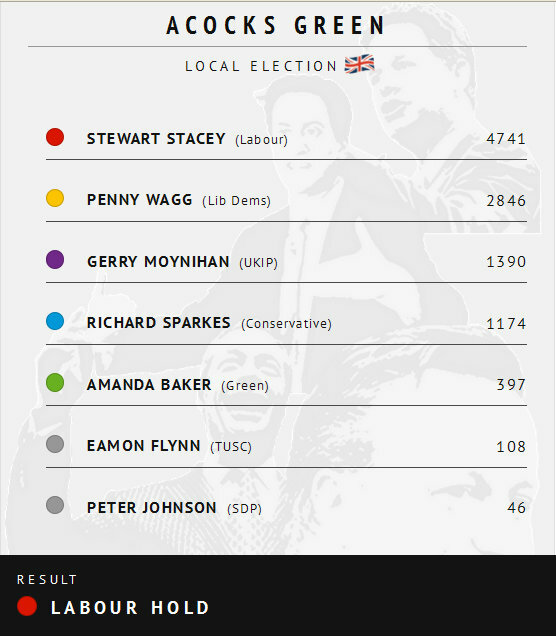 As anyone who takes a serious interest in Acocks Green large ‘P’ politics will know, and as all the candidates in this famously Lib-Lab Ward would have known, the outcome could only ever have been Stacey or Wagg. In recent weeks there has been quite vigorous campaigning in the Ward, and the turn-out was good. 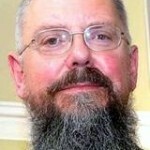 There had been speculation and rumours that given the Lib-Dem win of Roger Harmer in Acocks Green last year, similar Lib-Dem wins in all three other Yardley Constituency wards, in 2014 and the apparent durability of Lib-Dem John Hemming’s tenure as MP, that a Lib-Dem win was on the cards in Acocks Green Ward today. Given the astonishing General Election results of last night, and the particularly bad showings for Lib-Dems, despite the Lib-Dems own counter hard campaigning, this was obviously a tougher mountain to climb than anyone had imagined. Moreover Labour put in sustained activity in Yardley in order to achieve the election of their MP candidate Jess Phillips, but Labour campaigners and campaign literature in the area were also both stressing the local choice of the incumbent’ candidate, long time Birmingham political ‘big beast’ Cabinet Member Stewart Stacey, Cabinet Member for Commissioning, Contracting and Improvement, and they were obviously keen to retain this lynch pin in Albert Bore’s Labour cabinet. Given both all this background, a prominent Labour candidate and the strong red colour of Birmingham now, Penny Wagg’s polling score of 2,846 is very respectable, even slightly up on Roger Harmer’s winning score of 2,679 last year against an unknown Labour candidate. Indeed she did better than many of her colleagues facing defeat in the General Election who often managed only a few hundred. As the Birmingham Mail full list of results shows the same is true for Lib-Dem candidates in many other Birmingham wards, although the votes of a handful of other well known and popular Lib-Dems held up fairly well. To turn to other candidates: last year there was no UKIP candidate. 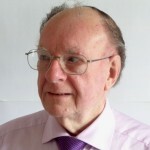 This year there was a UKIP candidate, Gerry Moynihan, who polled 1,390 and the Conservative Richard Sparkes managed 1,174 against the previous Tory’s score of 372. At a guess for Richard this was a result of a combination of active campaigning and the overall current popularity of this party! The relatively strong showing of UKIP probably also owes something to a combination of national trends and local work. 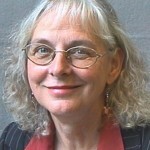 Some of the votes for these two candidates may possibly also have been ‘deducted’ from the potential score for Penny. The three other candidates, Amanda Baker (Green), Eamonn Flynn (TUSC) and Peter Johnson (SDP) all also stood last year, but polled slightly worse than last year. Probably this was no particular reflection on them and was more to do with the furious way in which this Ward was contested by other parties. Finally, it has been noted that a high proportion of our candidates live in the Ward. 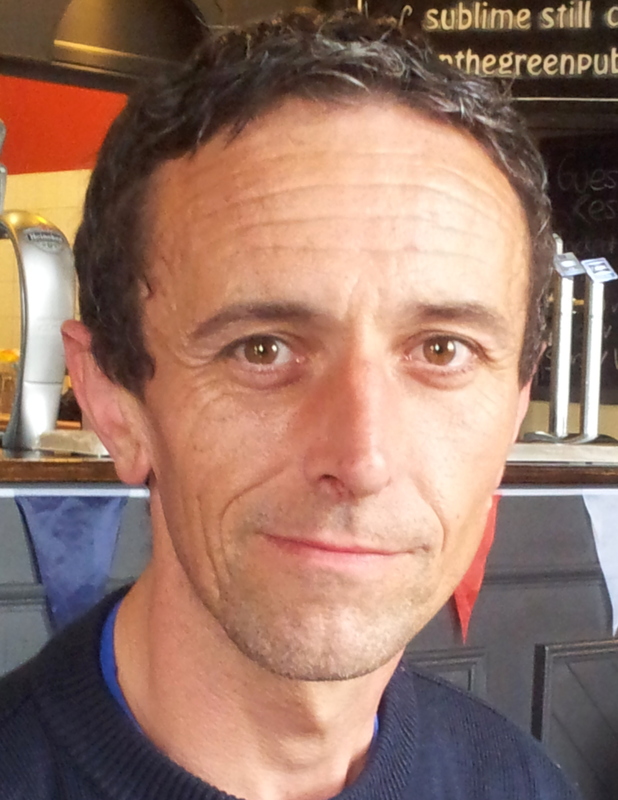 Yes – we do do Politics in Acocks Green! Congratulations to the winner, Stewart Stacey, and better luck another time to the (main) looser, Penny Wagg. All candidates’ statements still here, if you want to mull them over.